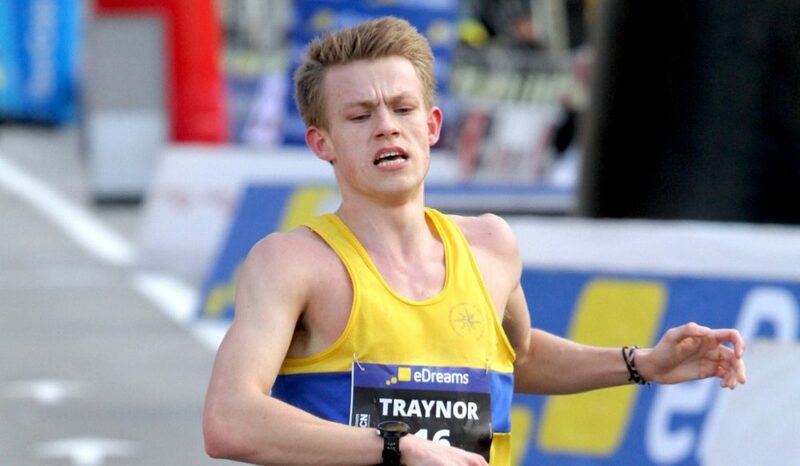 After a breakthrough in Barcelona, it safe to say Luke Traynor more than earned his selection in the GB team for the World Half Marathon Championships. 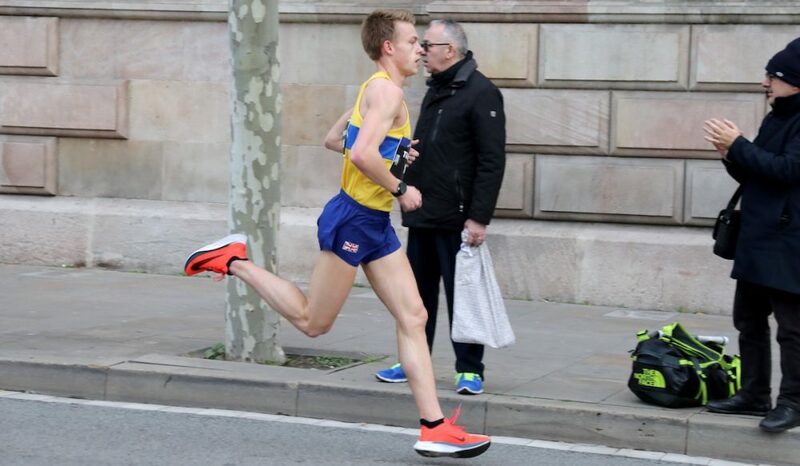 The 24-year-old Scot ran 61:57 for 9th in the Spanish city to take over two minutes from his personal best. It was only his second half marathon after his debut win at the Manchester Half in October. He will admit in his earlier years to enjoying student life in the UK a bit too much, but following a scholarship to Tulsa University in 2015, the discipline of the US collegiate system soon had him on a more prosperous path. 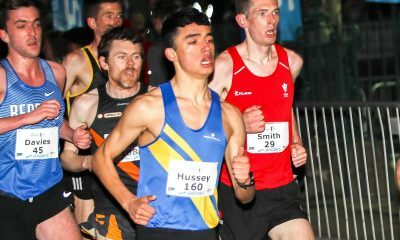 Returning home to Glasgow in June 2017, the Giffnock North runner went on to post track PB’s of 14:00.63 over 5000m as well as 29:08 in the 10,000m. On the road, he ran a 10k best of 29:25 before his maiden 13.1-miler in Manchester. 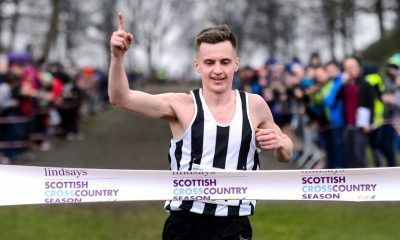 From a young age Traynor’s talent has been undeniable, and after his second bite at the half marathon catapulted him to number three on the all-time Scottish rankings he’s now on the road to becoming a world-class distance runner. It’s a goal he takes very seriously, so much so that he has moved his training base to Mammoth Lakes in the Sierra Nevada, which sits at an altitude of 8000ft. He was there in the mountains of California prior to racing in Barcelona and returned shortly afterwards to get back to work. 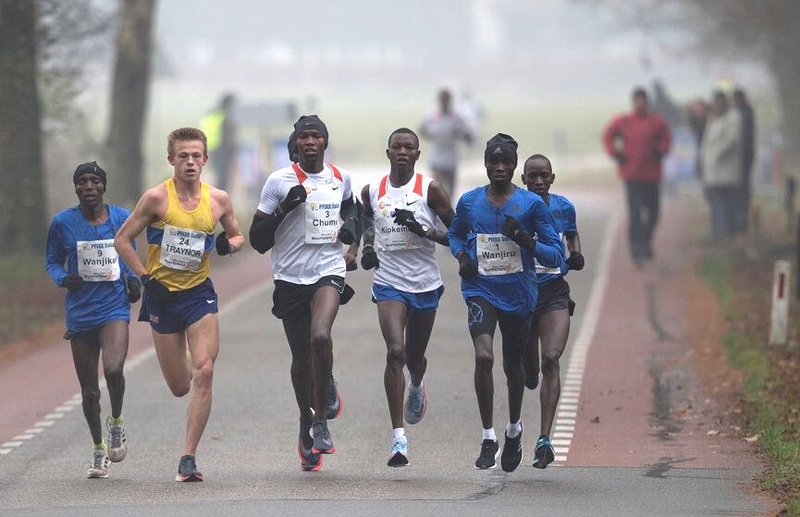 Now having been selected on the British team for the Valencia World Half Marathon Championships on March 24, he has the perfect platform to show the fruits of that labour on the world stage. 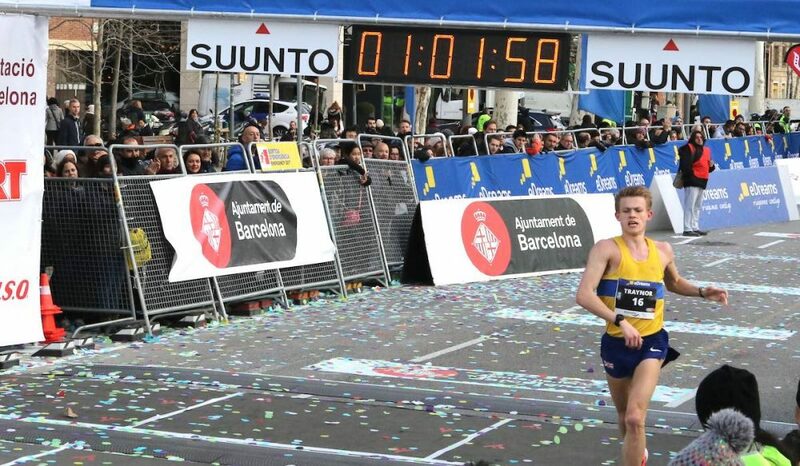 Fast Running decided to catch up with the young endurance runner to chat about his breakthrough in Barcelona, how he trains and lots more. Fast Running: Firstly, congratulations your big half marathon PB in Barcelona, it was a fantastic run. Could you talk us through that day? Luke Traynor: It was a strange day, different to any other race day. I felt quite weak the morning of the race but put it down to the 5.30am alarm. The race obviously went well and I felt good throughout, however on the bus back to the hotel I couldn’t stop shivering. I remember asking Jonny Mellor if it was cold on the bus and he said that it wasn’t. Basically, I was in a pretty bad way for a good few hours after the race but after a long hot shower and a nap I felt like myself again and went to watch Barcelona play in the afternoon. Ben [Connor, who finished one place ahead of Traynor] and I then naturally took advantage of the free wine with dinner before calling it a night. The feeling of normality was short lived though, as the days following the race my condition deteriorated, and a trans-Atlantic flight back to California didn’t help my recovery. I’d like to confirm this wasn’t a hangover. I was unable to leave my bed for the first three days of this training camp with some sort of illness. I ended up losing a full week of training, but recovery was most important. We think I had something working on me during the race and combined with that sort of effort my body just needed some downtime. Two weeks later and I was feeling healthy again and back up in full mileage. FR: How was your preparation leading into the half-marathon? The preparation was ideal. We got some good weather in Glasgow the weeks leading up to Barcelona and I was able to get some quality sessions in on the roads. FR: Could you tell us some specifics about the race itself? LT: The course was brilliant, there were a good amount of spectators at all points and it was almost completely flat. The only low point really came at 5K, when Ben put in a good surge and pulled away, at that point, I realized I was going to be running the remaining 16K alone. FR: At what point did you really think you were going to break 62 minutes? LT: I saw that the clock at 10k which read 29.20 and I felt pretty good. Then going through the 15k split in 44 minutes flat I still felt strong and deliberately picked up the pace. I didn’t know the splits for any particular finish time, I wasn’t putting any time goal on the race as I didn’t want to limit myself. FR: What was your fueling like during the race? LT: No food or water during the race, though I would probably consider it for anything longer than the half. FR: So overall, before and after the race how has your training been going? LT: Training has been really good. I am now under the guidance of Andrew Kastor and I really feel that his coaching philosophy suits the type of training that I thrive off. Relatively high mileage with the majority of runs at a very, very easy pace. FR: Back to Barcelona itself, could you outline a key week of training in the build-up? LT: Five weeks before the race, I had a good three-week block where I averaged 95 miles per week and hit two solid sessions each week too. FR: Staying on the topic training, what is your favourite and least favourite sessions? LT: I do love cruising around the track at a decent pace, so getting 20x400m in always great. Although I’m definitely becoming more of a road runner. I am not a fan of the 3x3mile session, but unfortunately, this is a staple in my half marathon training. When I am in Mammoth Lakes we do this session on a sandy road, half downhill and half uphill at 4500ft, it is not pretty. FR: What is your nutrition like? LT: Diet is definitely an area of my training that is slowly but surely getting better, anyone that knows me will not hesitate to say it is far from perfect though. ‘My favourite food’ would be a pretty extensive list and probably considered blasphemous to the distance diehards. Let’s go with a good Chinese chicken chow mein though, hard to beat that. FR: What is your favourite bit of kit? LT: As I am currently completely unsponsored I’m hesitant to be giving plugs away. However, as I don’t expect a Bose sponsorship anytime soon I’m going to go with there quiet comfortable headphones. Absolutely my best friend when grinding out hundreds of miles alone in Glasgow. FR: How was your time in the US collegiate system? LT: I graduated from The University of Tulsa in June 2017 and I enjoyed a successful two-year stint there. I do think the time there elevated me from a pretty decent runner to actually believing that I could compete with the best. In terms of the lifestyle, it was pretty perfect for me. I was a postgrad student and so only had night classes, meaning that I essentially lived the life of a pro athlete; training in the morning and afternoon and being able to sleep a lot in between. FR: Between college and training now in the US, what is your favourite place to race there? LT: Definitely Eugene, Oregon. I made the NCAA national outdoor 10,000m final both years that was at Tulsa. Getting to run at Hayward Field was fantastic and the atmosphere that place produces is incredible. FR: Aside from Barcelona, what has been your best ever race? LT: Probably the Montferland 15k in December 2017. 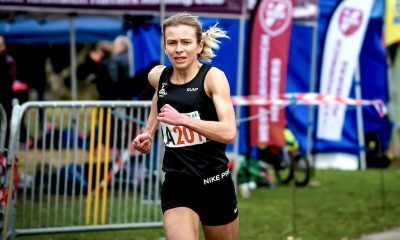 Having just come down from altitude in Mammoth Lakes I absolutely bombed the Euro XC trials in Liverpool, which was the main aim for the season. Straight back to the grind, I was in a full mileage week, but on the Thursday I got accepted into the high-quality 15k and flew out the following morning. It felt incredible throughout that race, pushing a world-class field through 10k just before losing contact the last couple of miles. FR: After your recent success at 13.1 miles, would you consider that your new distance? LT: The 10,000m on the track is probably still my favourite distance. I don’t think I have got anywhere near my potential in that event, but I still love it, especially in a championship race. There is something about the build-up of tension throughout the initial 23 or 24 laps that just gives me such a buzz, then you release it all in a crazy last lap burn up, that is honestly quite fun. FR: After the World Half Marathon Championships, what’s on your radar this year and beyond? LT: After Valencia, I will probably aim to spend the summer making my track times more representative of my ability. I currently don’t have one track event that I can say I’m proud of and hopefully that will all change this summer. I really want to compete at the Highgate track 10k, it looks like some buzz. It has really taken off the past few years, however, I have been in the US and unable to compete. I don’t think it will fit my schedule this year either, but I haven’t ruled it out completely yet! Bigger picture I definitely don’t set goals. I don’t set time goals for races, never mind career goals. In fact, I barely plan a few months down the line. It might be an unorthodox approach and perhaps that’s because training and racing up until now have been based alongside a job. I just like taking things one week at a time, you never know what is around the corner in this sport and you have to try and appreciate every race. FR: Do you look up to any runners? LT: I’m not really a huge running fan at the elite end of things. I like keeping track of the performances of people within my club team and folk from Tulsa, but apart from that I probably won’t notice any groundbreaking performances unless I come across it on social media. That all said, Callum’s [Hawkins] last few years have been incredible and impossible not to notice. Knowing that the majority of his training is also done solo has shown me there isn’t a secret, it consistency and determination. FR: To finish tell us something interesting about yourself people don’t know? LT: I played the trumpet all the way through primary and high school. I honestly used to hate it but now wish I’d stuck to it.